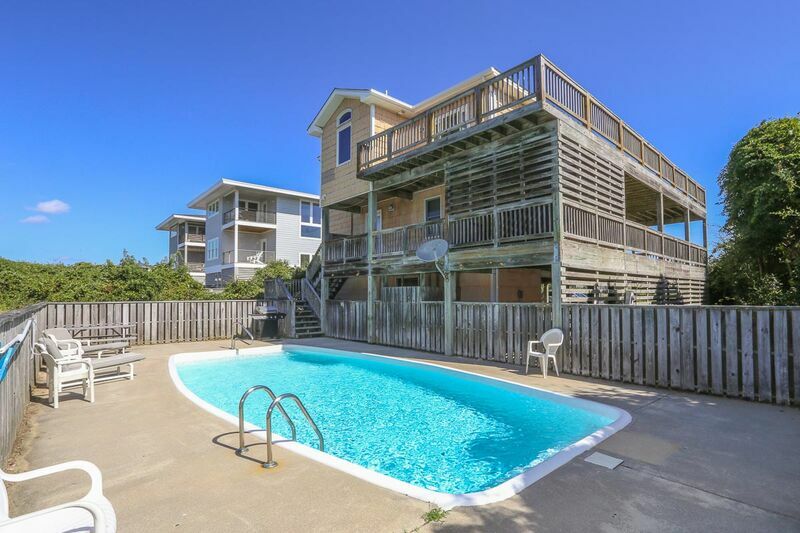 This semi-oceanfront home with nearby beach access features an in-ground pool and hot tub. Enjoy ocean breezes and a fabulous view from the great room of this beautiful home. An elevator and wide doorways complete this extraordinary residence. 75 yards to beach access. Ocean Blvd. must be crossed at designated crosswalk to reach beach access. Den with 2nd full-size refrigerator, TV, computer with printer and full bath. Laundry, 3 bedrooms (master bedroom with King and private bath, 1 with Queen, 1 with Pyramid bunk and Trundle), hall bath. Master bedroom (with Queen and private bath with low threshold shower), living, dining, kitchen. Screened porch with hot tub. Our first visit to OBX was a success and this rental contributed. We loved the location and great beach access plus easy drive both north and south and to grocery store. The house was clean, kitchen stocked with all kinds of utensils and pans, pool was great and 10 of us fit perfect with 4 bedrooms and 4 baths! Our recommendations would be to have some shade with umbrellas at pool area and deck area, Have beach chairs and beach umbrella for use, also the decking has some nails that need fixed plus the landscaping needs an overhaul. Very satisfied overall other than some cosmetic recommendations! Would be great for families with physical handicaps!